In tempurabeslag met een remouladesaus. When you find yourself in the most cozy street of Utrecht, 'Zeedijk' there is a place you should definitely drop by. The friendly staff on the ground and in the kitchen will make you a perfect night, full of great wines, nice meals with fresh ingredients and great ambiance. With a name which is the translation of 'happy', your night cannot be a one to forget! Car park Voor de deur in de straat. A stylish and cozy restaurant with amazing food and excellent service, definitely worth the walk from the city centre. Blij smiling and friendly staff made us feel at home and also helped us with regards to some food allergy. Delicious food with a smart option allowing you to pick half portions and taste different dishes! Highly recommended! Quiet neighbourhood restaurant with great vibe. Staff were helpful. Great concept of half serve plates so you can taste more dishes. Blij is one of our most favorite restaurants in Utrecht. They never disappoint us. Delicious food. Excellent service provided by Isa who was courteous throughout & patiently translated the menu for us. We were a group of 5 and we all enjoyed our meals. Great idea to be able to split the courses into two so you get to taste more of the lovely dishes which were very reasonably priced. Great ambience too. Nice, quite small restaurant with very good service. We were there on Saturday evening and it was pleasantly busy, with both of us taking samsam dishes, we were expecting to wait long, but we were nicely surprised with very quick service! With the 2 of us we ate well and enough, had some drinks in between and paid only 75 euros for 3 courses and 5 different dishes per person! The restaurant is very crowded, It is hard to walk as the tables are so close together. They could have also had more staff working, it was hard to reach a waitress. Food was great! This place has been a really nice discovery, in a different and super cozy area of Utrecht! 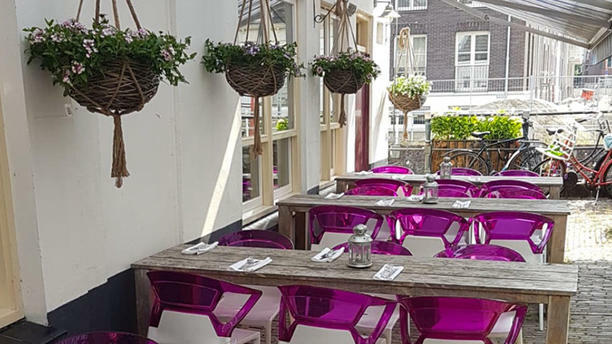 The food was very good and the service friendly and fast (surprisingly considering the dutch standard...), we can't wait to try one of the tables on the beautiful terrace on the canal this summer! aardige bediening. Lekker eten. Wel lang wachten op het eten, maar dat kwam door een storing. Kleine tafels, dicht op elkaar; daardoor wel gezellig, maar ook erg rumoerig. Very nice place. Totally recommend it. Food was very good, tasty and good quantities. The service is very friendly, although a bit slow for our taste. My wife and I enjoyed all we had. We will definitely go back! Lovely dinner at Blij, in the garden at the back, next to the water. The food was delicious and in generous portions (even the samsam plates). However the service was not good at all. We waited 20 minutes to even get a menu. Then we waited for our drinks for 35 minutes and realized that they were not even ordered. Another 30 minutes wait for the starters and another 30 minutes in between each course. In total it was a 3h15 minute 3 course dinner... Disappointing. I love the concept of samsam and the waiters were really happy and nice! The decor is really nice too, especially the terrace that gives off an idyllic vibe. I can imagine that it's even more lovely in the summer!